Tag words: Listeria, Listeria monocytogenes, listeriosis, food poisoning. 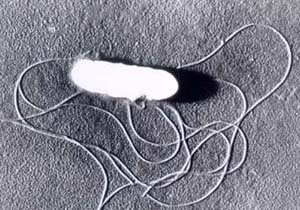 Listeria monocytogenes is presumably ingested with raw, contaminated food. An invasin secreted by the pathogenic bacteria enables the listeriae to penetrate host cells of the epithelial lining. The bacterium is widely distributed so this event may occur frequently. Normally, the immune system eliminates the infection before it spreads. Adults with no history of listeriosis have T lymphocytes primed specifically by Listeria antigens. However, if the immune system is compromised, systemic disease may develop. Listeria monocytogenes multiplies not only extracellularly but also intracellularly, within macrophages after phagocytosis, or within parenchymal cells which are entered by induced phagocytosis. In mice infected with L. monocytogenes, the bacteria first appear in macrophages and then spread to hepatocytes in the liver. The bacteria stimulate a CMI response that includes the production of TNF, gamma interferon, macrophage activating factors and a cytotoxic T cell response. Possibly, in humans, a failure to control L. monocytogenes by means of CMI allows the bacteria to spread systemically. As well, unlike other bacterial pathogens, Listeria are able to penetrate the endothelial layer of the placenta and thereby infect the fetus. A peculiar property of L. monocytogenes that affects its food-borne transmission is the ability to multiply at low temperatures. The bacteria may therefore grow and accumulate in contaminated food stored in the refrigerator. So it is not surprising that listeriosis is usually associated with ingestion of milk, meat or vegetable products that have been held at refrigeration temperatures for a long period of time. 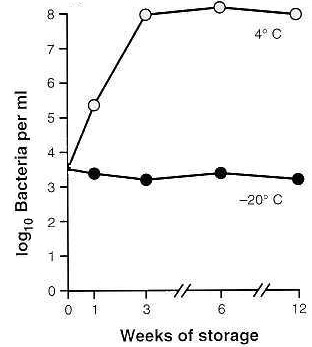 Growth and viability of Listeria monocytogenes in certain foods at freezing temperatures (-20oC and refrigeration temperatures (4oC) over a 12 week period. Adapted from Baron's (Online) Medical Microbiology: Miscellaneous Pathogenic Bacteria. 2008. As in the case of Vibrio cholerae, wherein movement, attachment and penetration of the intestinal mucosa are determinants of infection (if not disease), this was thought to be the situation with Listeria, which is also acquired by ingestion and must also find a way to attach to the intestinal mucosa. With cholera, the actively-motile vibrios are thought to use their flagella to swim against the peristaltic movement of the bowel content and to penetrate (by swimming laterally) the mucosal lining of the gut where they adhere. Curiously, although Listeria are actively motile by means of peritrichous flagella at room temperature (20-25°C), the organisms do not synthesize flagella at body temperatures (37°C). Instead, virulence is associated with another type of motility: the ability of the bacteria to move themselves into, within and between host cells by polymerization of host cell actin at one end of the bacterium ("growing actin tails") that can propel the bacteria through cytoplasm. However, one should not totally dismiss the advantage of flagellar motility for existence and spread of the bacteria outside of the immediate host environment. Listeria can attach to and enter mammalian cells. The bacterium is thought to attach to epithelial cells of the GI tract by means of D-galactose residues on the bacterial surface which adhere to D-galactose receptors on the host cells. If this is correct, it is the opposite of the way that most other bacterial pathogens are known to adhere, i.e., the bacterium displays the protein or carbohydrate ligand on its surface and the host displays the amino acid or sugar residue to which the ligand binds. Having said this, macrophages are well known to have "mannose binding receptors" on their surface whose function presumably is to ligand to bacterial surface polysaccharides that terminate in mannose, as a prelude to phagocytic uptake. 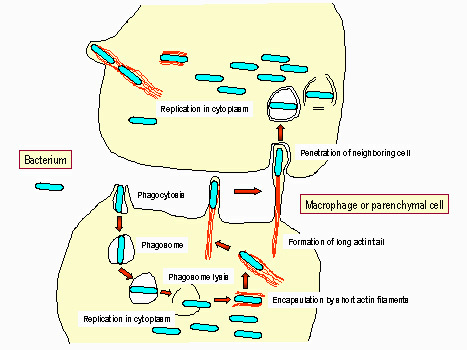 The bacteria are then taken up by induced phagocytosis, analogous to the situation in Shigella. An 80 kDa membrane protein called internalin probably mediates invasion. A complement receptor on macrophages has been shown to be the internalin receptor, as well. After engulfment, the bacterium may escape from the phagosome before phagolysosome fusion occurs mediated by a toxin, which also acts as a hemolysin, listeriolysin O (LLO). This toxin is one of the so-called SH-activated hemolysins, which are produced by a number of other Gram-positive bacteria, such as group A streptococci (streptolysin O), pneumococci (pneumolysin), and Clostridium perfringens. The hemolysin gene is located on the chromosome within a cluster of other virulence genes that are all regulated by a common promoter. Survival of the bacterium within the phagolysosome also occurs, aided by the bacterium's ability to produce catalase and superoxide dismutase which neutralize the effects of the phagocytic oxidative burst. Additional genetic determinants are necessary for further steps in the intracellular life cycle of L. monocytogenes. One particular gene product, Act A (encoded by actA) promotes the polymerization of actin, a component of the host cell cytoskeleton, on the bacterial surface. Within the host cell environment, surrounded by a sheet of actin filaments, the bacteria reside and multiply. The growing actin sheet functions as a propulsive force which drives the bacteria across the intracellular pathways until they finally reach the surface. Then, the host cell is induced to form slim, long protrusions containing living L. monocytogenes. Those cellular projections are engulfed by adjacent cells, including non-professional phagocytes such as parenchymal cells. By such a mechanism, direct cell-to-cell spread of Listeria in an infected tissue may occur without an extracellular stage. Steps in the invasion of cells and intracellular spread by L. monocytogenes. The bacterium apparently invades via the intestinal mucosa. It is thought to attach to intestinal cells by means of D-galactose residues on the bacterial surface which adhere to D-galactose receptors on susceptible intestinal cells The bacterium is taken up (including by non phagocytic cells) by induced phagocytosis, which is thought to be mediated by a membrane associated protein called internalin. Once ingested the bacterium produces listeriolysin (LLO) to escape from the phagosome. The bacterium then multiplies rapidly in the cytoplasm and moves through the cytoplasm to invade adjacent cells by polymerizing actin to form long tails. L. monocytogenes produces two other hemolysins besides LLO: phosphatidylinositol-specific phospholipase C (PI-PLC) and phosphatidylcholine-specific phospholipase C (PC-PLC). Unlike LLO, which lyses host cells by forming a pore in the cell membrane, these phospholipases disrupt membrane lipids such as phosphatidylinositol and phosphatidylcholine (lecithin). The bacterium also produces a Zn++ dependent protease which may act as some sort of exotoxin. Mutations in the encoding gene (mpl) reduce virulence in the mouse model. Finally, an operon called lmaBA encodes a 20 kDa protein located on the bacterial surface. The protein LMaA induces delayed type hypersensitivity and other CMI responses.